Have you become a food business owner? Liaise with the previous owners to discuss any previous requests from Council, including construction issues. Ensuring you meet the Food Safety Supervisor (FSS) requirements. Updating the business's FSS details, online. The Food Act requires that all permanent, mobile and temporary food businesses be registered with the relevant authorities prior to commencing trade. All food businesses must also notify Council if any of the following details change; proprietor's name, business address, trading name of the food business, contact details or ABN details. Should you wish to cease trading you are required to complete and submit a Business Closure Notification form to Council. Do you need a Food Safety Supervisor (FSS)? Most food businesses are required to have at least one staff member trained and appointed as a Food Safety Supervisor (FSS). The training requirements must be undertaken via an approved Registered Training Organisation (RTO). 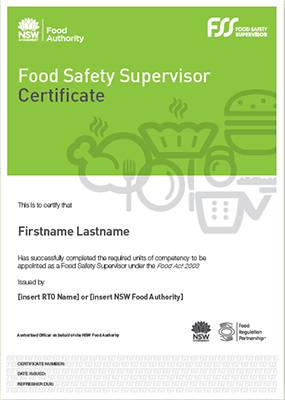 It is a requirement that the Food Safety Supervisor Certificate be easily accessible on the food business premises and able to be produced to an Authorised Officer upon request. For more information please refer to the NSW Food Safety Factsheets HERE.